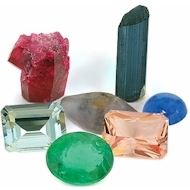 Multicolour Gems Ltd is a major importer of rough stones from East Africa and Madagascar and wholesaler of loose precious and semi-precious gemstones, including alexandrite, fancy sapphires, tanzanite, tsavorite, aquamarine, tourmaline and more. The Cut may be the most challenging of the four C´s to understand. The brilliance of a diamond is primarily determined by its cut. Apart from the general shape of a diamond, the "cut" refers to the reflective qualities of the stone. A good cut gives a diamond its brilliance, i.e. the brightness that seems to come from the very heart of it. As shown in the images below, when a diamond is well-cut, light enters through the table and travels to the pavilion where it reflects from one side to the other before reflecting back out of the diamond through its table and back to the observers eye. This reflection of light results in brilliance, and it is this flashing, scintillating effect that makes diamonds so mesmerizing. Certain proportions have been found to radiate the maximum amount of brilliance. The most important factors that affect brilliance are related to the proportions; the depth compared to the diameter, the width in relationship to the diameter, the crown height, and the pavilion angle. The pavilion angle is the most important factor and it should be 40.75 degrees for maximized brilliance. This angle is known as the critical angle among cutters. Any angle less than the critical angle will result in light leakage. Angles greater than the critical angle, will result in some darkening in the center of the stone. Because cut is so important, several grading methods have been developed to help consumers evaluate the cut of a particular diamond. In general, these grades are: Ideal, Premium, Very Good, Good, Fair & Poor. Selecting the grade of a cut is somewhat subjective so the GIA and other labs have developed a detailed grading system to encompass every conceivable aspect of a stones cut in order to determine the final cutting grade. Please note that the descriptions below are general guidelines. This cut is intended to maximize brilliance. Ideal cut diamonds generally have smaller tables (53 – 58%), and are complemented by a maximization of light dispersion. GIAC´s Excellent-Excellent stones as well as AGS 000 stones fall into this category. This category applies only to round diamonds. Also intended to provide maximum brilliance and fire, premium cut diamonds can generally be found at slightly lower price points compared to Ideal cut diamonds. These diamonds reflect most of the light still creating good but less than ideal brilliance. With these diamonds, the cutters may have chosen to stray slightly from the preferred diamond proportions in order to create a larger stone. Diamonds that reflect much of the light that enters them. Such stones result from the cutterC´s choice to create the largest possible diamond from the original rough crystal, rather than removing extra weight to create a smaller better cut stone. Diamonds in this range offer excellent cost savings to customers who want to stay within a certain budget without sacrificing quality or beauty. A diamond graded as fair or poor reflects considerably less light than better cut stones primarily because of deviations from ideal proportions. Stones like these are sometimes bought by dealers and re-cut to improve their appearance and value without sacrificing too much weight. Most diamonds contain some inner flaws or inclusions that occur during the formation process. The visibility, number, size, and location of these inclusions determine what is known as the clarity of a diamond. Diamonds that are inclusion free are more transparent and reflective and thus more highly prized, and priced. A diamonds’ clarity refers to the presence or absence of inclusions within the diamond crystal. Typical inclusions are; blemishes, feathers, pin points, naturals, black carbon spots and other non diamond minerals. Flawless or near inclusion free diamonds are extremely rare and correspondingly much more expensive. Diamonds are graded for clarity with 10x loupe magnification. Grades range from Internally Flawless, (completely free of blemishes and inclusions even under 10x magnification, to I3, (diamonds which possess large, heavy blemishes and inclusions that are visible to the naked eye). Flawless or Internally Flawless. No internal inclusions. Very rare. Very Very Slightly Included. Minute inclusions very difficult to detect under 10x magnification. Very Slightly Included. Minor inclusions invisible to the naked eye and seen only with difficulty under 10x magnification. Slightly Included. Noticeable inclusions very difficult to detect under 10x magnification. Included. Inclusions visible under 10x magnification as well as to the human eye. While the presence of inclusions will determine the clarity grade of a diamond, the inclusions can also be viewed as proof of a diamonds identity and natural origin. GIA certificates include what is known as a "plot" which notates the type and position of a stones inclusions. The plot is a two dimensional inclusion map superimposed on the face up and pavilion views of the stone. With each inclusion noted in the correct position, it can be thought of as a "diamond fingerprint." Since no two diamonds are exactly the same, comparing the uniqueness of a diamonds clarity characteristics with the plot provided on that diamonds certificate offers assurance that the diamond in hand is the same as the one described in the certificate. While Flawless diamonds are the rarest, a diamond does not have to be flawless to be stunning. Diamonds with VVS, VS, & SI grades are also excellent choices in terms of both value and appearance. In fact, even stones with I1-I3 grades may also offer good value since not all "visible" flaws are "equally" visible. Colorless diamonds are the most desirable since they allow the most reflection of light. Off white diamonds absorb more light, inhibiting brilliance. Generally, the color of a diamond refers to the presence or absence yellow or brown. Note: the more colorless a diamond, the higher its value. The coloration results from the presence of certain elements during the formation stages of a diamond crystal and few stones are truly colorless. In order to grade C´whitenessC´ or colorlessness, most jewelers refer to GIAC´s professional color scale that begins with the highest rating of D for colorless stones. As the amount of yellow or brown in a stone increases, it is assigned a color grade which relates to the amount of yellow or brown in the stone. D, E, and F color stones are nearly colorless and stones with M color begin to look more yellow. G, H, and I stones are slightly off white. The color scale continues all the way to Z. The differences in near color grades are very subtle and it is not uncommon for gemologists to disagree on a color grade even with reference to a master set. While diamonds of D-F color are the most valuable because of their rarity, faint yellow diamonds will also appear colorless to the untrained eye. In fact, if working with a tight budget, even an M-N color diamond set in yellow gold could go unnoticed to all but experts. However, while most people strive to buy the most colorless diamond they can afford, some people actually prefer the warmer glow of lower-color diamonds. Fluorescence is an effect that is seen in some gem-quality diamonds when they are exposed to long-wave ultraviolet light. Under most lighting conditions, this fluorescence is not detectable to the eye. A carat is the unit of weight by which a diamond is measured. Because large diamonds are extremely rare and small diamonds are much more common, the prices of a diamonds are a function of size and increase in some kind of a geometric fashion in relation to their weight. Diamond prices are also determined by supply and demand. Read this guide to get a better understanding of what a carat is and how it affects the appearance of a diamond. A carat is a unit of measurement used to weigh a diamond and other gemstones. One carat is equal to 0.2 grams. Since large diamonds are so rare their value per carat is also much higher. Deciding on carat size is really about striking a balance between size and quality within a certain budget. If a larger stone is preferred, one can always sacrifice color, cut, or clarity in order to remain within a specific size and price range.